Help Diagnose an SCT? - SolarChat! I know a lot of folk image with SCT's so I'm looking for some general wisdom. I have a Meade 10" F10 SCT. It appears very clean, I can't see any evidence of a coating problem or degradation. I can't see anything wrong with the corrector plate nor the primary mirror and the secondary mirror is spotless too. The scope looks very clean and well taken care of. I installed a crayford focuser for SCT's to avoid any mirror shifting for fine focusing. So far, I'm totally underwhelmed trying to image with it. I originally got it with the intent of being able to enjoy white light solar for convection cells specifically, and secondary uses would be things like planets & lunar imaging and visual. But, so far, I've not been very happy with the results. For reference, I keep it in my observatory and it's near outdoor ambient temperature all the time so I don't think (but could be wrong) that it's thermal equilibrium issues. Also for reference, it's collimated fairly well and I have experience collimating SCT's, but I wouldn't call myself a master at it. Star tests (on real stars) look appropriate for a collimated scope both in and out of focus. Seeing is generally decent, here in Florida, for comparing stuff, and I'm sure most have seen my other solar images in general from refractors. I'm just failing hard with this SCT. This is all from the standpoint of using an ASI174MM (solar & lunar) & ASI224MC (planets) for the specifics of that. I can't get focus on the solar surface. I have Baader solar film, both visual & photo grade (ND3.8) that are full aperture. I've tried both with the same results. I've tried with just the solar film at native F10. That worked the best. I've tried at F20 and F30 with different combinations to increase contrast such as continuum filter (540nm) and various near UV filters (395nm, etc). I can't seem to get convection cells worth anything. Yet, on my 150mm refractor, at any temp, I can easily get convection cells and see them as clear as day at F8, F16, F24, etc with the same exact filters. I've only gotten focus once with the 10" at F10 by going to the limb, getting a sharp edge, and the moving inwards and trying to fine focus. But at F20, I can't get any visual of the cells. Nothing. It's a smudge, no matter what. I can easily get a planet in view, focus, etc, like expected. But, they're mostly smudges. I wondered if maybe it was due to atmospheric dispersion. They're barely 40 degrees where I am, and lower, so that's an option to explain the problem. I was able to easily split Cassini on Saturn, but Jupiter was a mushy mess and Mars are mostly dust storms at the time and also a horrible mushy mess with no definition what so ever. I easily could put this on atmospheric dispersion and low latitude. But, I'm not experienced enough with planetary imaging with larger instruments to know for sure. I easily get sharp high contrast focus on the lunar surface, at F10, F20, and even F30 without a problem. It's sharp from edge to edge in the FOV with the images. This is what throws me off. How can I get high resolution sharp contrasty images of the lunar surface, but get mushy planets and zero visible convection cells on solar? The lunar results keep my interest in the scope. But everything else just falls miserably flat compared to it. It's easy to get focus, no problem to image. So this confuses me the most. Granted, the lunar surface is super easy to image as it's so contrasty and easy to see visual sharp focus and it's easy to expose because it's bright. But, I looked for evidence of collimation problems, etc, and it was sharp edge to edge. I get fine detail at high resolution, so it seems everything works as far as it should. So forgive this long windy post... I'm just looking for advice on how to diagnose what's going on. Or what I should look for next? I would love to use this for solar, but I can't seem to see squat with it. It's mushy on planets. And yet I can get sharp contrasty details on the moon. I'm just confused. Any ideas are welcome on what to do, try or consider! Or is this thing just a throw-away-scope? Re: Help Diagnose an SCT? It is not possible to judge a scope by just looking at some pictures of planets and the moon. How good are your processing skills at planetary for example? It is sometimes completely different compared to solar processing. How good is the scope visual? I use a 7 inch Intes M703 and a 9 inch Maksutov based on a Intes MN91. Here an example of Saturn, this season with the 7 inch. Altitude was 15 degrees (!). Without a ADC it was totally impossible. First the stacked image that came out of AS!. Second picture is the image after processing in RS. 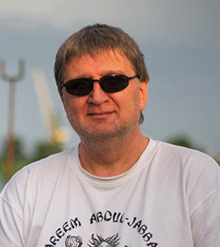 Not that I am really good at processing, but you can see the difference. I am optimistic about this your scope. 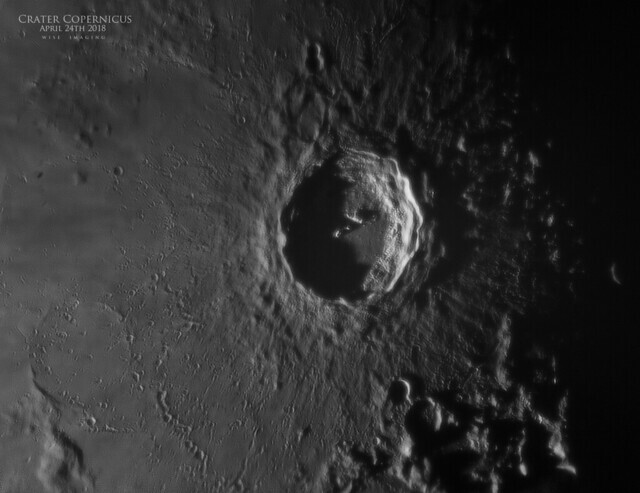 Smaller craters around Copernicus makes me optimistic. I think that the only problem is that your scope is inside the building which can and does impact on the seeing as the source of turbulence of two kinds: convections and air flows disturbations. 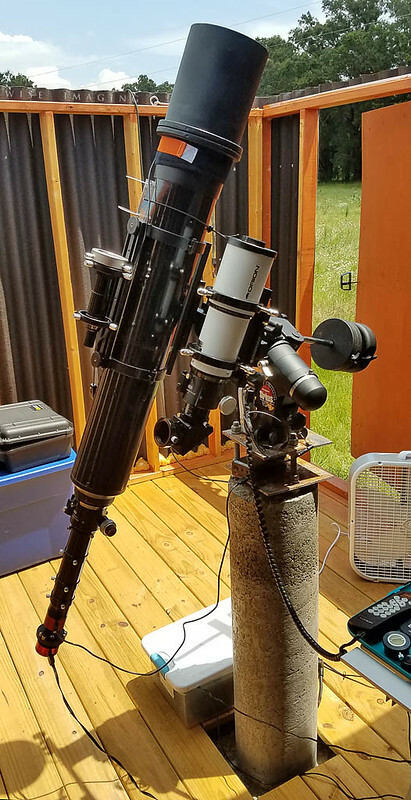 The best you can do is to install this telescope outside of your observatory at a grassy lawn and cover it by a white cotton bedsheet and possibly to pour the grass aroud (near) the scope from the east (morning) and west (early evening). And, of course, with a 10" aperture you need to observe not later than the sun will rise higher than 30-35 degree above a horizon. In most locations an optimum is between 22 and 28 degrees. Of course, Apollo was right telling you that from the 6" aperture it is better jump higher than to an 8". 10" is excellent, but an 11" size is the size you can stay with forever. I tried a secondhand Celestron 9.25 with ND3.8 UV/IR and Baader continuum with TVx5 or Barlow x3. It lacked contrast and was very difficult to focus. Stacking software failed to latch onto the granulation cells. After reading about Solar Newtonians on the forum I got hold of a very cheap 200mm f1000 Skywatcher Newtonian and used the same filters. It was orders of magnitude better for contrast and ease of use. With a Televue x5 I can image at 5000mm. I have not tried removing the mirror coating as I can imagine getting heat issues in the tube. However it is simple and less glass than an SCT. I have not pursued the SCT problem much as this SW 200 has solved my imaging requirement for now, in my situation with moist wind and moderate seeing usually. Let's start with the resolution of the lunar and planetary images. They are far from beeing on pair with what a 10" telescope can give. This leads us to the question of seeing and / or optical quality of the telescope. The simple question is do you see the Airy disk when you collimate your telescope at night ? - in any case, if you don't see the Airy disk you can't collimate properly your instrument an night. This means you can forget about getting good solar image. You need perfect collimation to get anything good with a 10" scope. - BTW, when you use your 10", how is the seeing with your 6" ? - try using a trichome a red filter (Astronomy, Baader) or even a 685 nm IR filter (Astronomik) this will improve the seeing. Keep the F/D ratio at 10-15. It really takes good seeing and perfect collimation to get good solar images with a 10" at F/20. 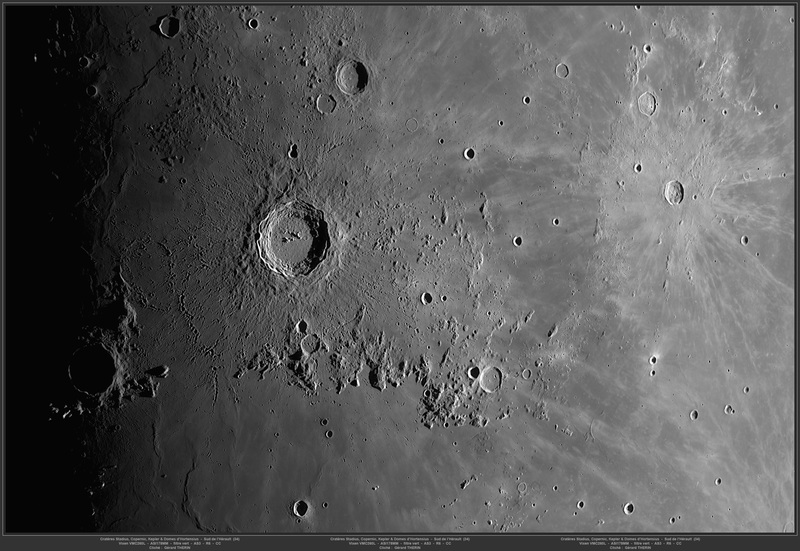 Finally keep exposure lower than 2 - 3 ms.
Marty's image of Copernicus shows some star-like bright points (summits of mounts or rocks) on a black background. They look a bit oval (may be atmospheric dispersion, may be a small astigmatism, but think that this is AD) and represent Airy disk. We can see even first diffraction rings around them. So, no real worry about telescope optics. Inside the Copernicus we can see details which are a bit smaller than the Airy disk (close to the FWHM of the Airy disk) and they are more or less symmetrical. Smallest craterlets there and here are also more or less symmetrical. With such optics solar granulations MUST be easily imaged if the seeing and focusing are OK.
Of course, better to check the collimation at night. I doing this every month, my scope is permanently installed). a) local seeing and observatory is not a good factor, much better is to install a telescope at a grassy lawn and pour water on a grass prior to image. If the grass is in a dew, no need to pour it. b) high elevation seeing. Better to image early morning when the weather is stable and a slight wind (3-5m/sec). To be honest, Gérad is among the best lunar imagers. My point is just to illustrate why I think the images you've got are far from the optical capabilites of a 10" instrument. You could probably nail the reasons why if you check it out. Thank you all for taking the time to give input. I had a little time tonight and wanted to do a little testing to try and figure a few things out. In the morning, I will try to use the SCT to do some white light imaging to provide some images (if I can get any) to help figure things out further. Last edited by MalVeauX on Sun Oct 14, 2018 3:46 am, edited 1 time in total. I slightly processed Marty's image of Copernicus crater and took the crop of this crated from the image taken with 260mm Vixen reflector. Here they are. Looking at the smallest details at the crater floor I can conclude that SCT keeps equality in resolution. All the differences in image quality can be explained in seeing, camera parameters and processing differencies. I bet the scope optics is not a main factor defined the difference of both images. So I had a little time this morning to test a few things. I had a "first light success" this time. So this SCT isn't the worst, but it's certainly not excellent. Anyhow, if you refer back to my previous post, I have some representations recorded to show the airy disk and collimation in general that I did on Vega last night with the SCT to see if I was closer to collimating it well. Looks ok. Maybe could be improved? I had the SCT pointed at the sun the moment it was over my observatory walls. I draped my solar cover over the wall to reflect heat and block rising heat from the wall. I wrapped the SCT in reflective insulating material. I used Baader 3.8ND photo grade film as the ERF. I started at native F10 with no filters just using the ASI174MM. I was able to get relative focus, with the two active regions giving visible umbra to at least focus on. But there was very little contrast. I could barely make out anything. I think it was primarily seeing related. I tried using a solar continuum (540nm) filter and it didn't make a difference really. I then added a 610nm long pass filter and I was able to see the spots a lot easier and was able to get better focus with the seeing better controlled at this longer wavelength, at the cost of resolution. So this makes me think it's seeing related mostly. I took the scope to F20 with a 2x barlow and kept the 610nm pass filter to see what I could get there and I know I had good focus because the visible umbra was split clearly, so I figured this would let me get a look at convection cells. I wonder if you are really in focus with the SCT. I never managed to focus properly with a Meade SCT until the moment I started using a SCT focuser. The focus mechanism of the Intes I am using now is much better (no mirror shift at all), but still not good enough for AP. And something else. Why would a 8 inch SCT be better than a 6 inch refractor? You win two inches, but you loose a lot because of the central obstruction. So by default, contrast is better in a refractor. Yes, there are great 8 inch SCT's and Maksutovs. But if you want to go a step further, make a move to 10 or 11 inch, I think Valery said the same. If you don't want to go that way, I would stay with the 150mm refractor. The only reason I am thinking of using my 7 inch Intes as the main solar scope in stead of the 6 inch refractor is portability. Sometimes I am not in the mood to take everything form inside the house into the garden. The 7 inch is so much smaller and lighter that I am willing (maybe.....) to sacrifice some detail. Last edited by bart1805 on Sun Oct 14, 2018 9:13 pm, edited 1 time in total. Sorry, I should have noted, the focuser is a GSO Crayford focuser for SCT's on the back of it. I don't focus moving the primary mirror (other than to get it close). The dual speed focus of the crayford does the rest of the work. Getting focus isn't too hard, as long as there is at least one sunspot or feature for me to see. Last edited by MalVeauX on Sun Oct 14, 2018 9:25 pm, edited 1 time in total. You bring up good points. My thought process is mainly that while I already have this 10" SCT, and I'm trying to sort out if it's a good enough scope for imaging or if it's just going to be my "moon scope" and nothing more, before deciding on anything else, since I have it. It's a lot more aperture than my 6" refractor of course. But, it's also big and heavy and I cannot mount any other scopes with it, so to do any other scale imaging I would have to take it off, rebalance, re-align, etc. That's a chore. I'm a slave to convenience which is why I have an observatory and its all mounted all the time ready to go. I'm looking for a flexible modular way to setup a higher resolution instrument with lower resolution short instruments, such as a C8 and a double stack PST and maybe a 60mm F10 achromat (for calcium & white light full disc). I've had more on this mount and it handles it. That would let me jump from different wavelengths and different scales quickly. Very convenient. So that's my thought process. For example, here's a setup I was using before: 150mm F8 side by side with 80mm F5 (masked to 60mm usually) for two quick imaging scales. Instead, however, replace the 6" with a 8" SCT (compact, lighter weight, bigger aperture) and replace the 80mm F5 with 60mm F10 and double stack PST (piggy back to the 60mm), also light weight and compact. I'm truly only looking at a C8 as an option because it's light weight, compact, inexpensive. I'd much rather buy an istar optical 8 inch refractor lens and build a truss refractor, but it would be very huge and heavy and cost three times as much. Anything bigger than 8 inches right now would require a new mount, adding another significant cost. At the moment my 9 inch Maksutov is being tested and optimised. How good is it at different wavelengths for example and it is getting the perfect collimation. I allready know it is really good for visual. The optics are built into a carbon tube and isolated from the inside out with Armaflex. Is there a possibility you could test your 10 inch on a optical bench somewhere? CS Bart. I don't know anyone that could test it. That said, I don't expect much. It's a very old scope, over 30 years old. I was just seeing if it was still something that could be serviceable, or if it would just be a cheap old scope for moon fun and not much else (I don't care for it visually either frankly, too long). I suppose I could reach out to the Chiefland Astronomy Village, they're local, or the Alachua Astronomy Club to see if anyone near by knows anyone that can measure and test optics. But again, probably not worth it. If I were to go the C8 route, I was thinking of a C8 Edge, so that it could be used for this purpose, but also for planets and DSO with a focal reducer and still be excellent optically to be as versatile as possible. Again, being a slave to convenience and not having to take any scopes down and just image whatever with minimal changes to the setup so it stays aligned and balanced and happy in the observatory 24/7. I didn't have high hopes for this 10" meade. I got it just to fiddle with for lunar surface and figured I might as well at least test it for solar. So far though, my 6" refractor kills it for solar. You can always fold the refractor beam like i did with my x-truder mod... Its real easy once you establish a frame. 8" refractor would weigh less about 25lbs total with all gear. That would would smoke the 8" sct. I had actually considered a big folded 8" refractor to go for something compact and natively long, but it would be hard to go double stack with inexpensive etalon options. I'm currently exploring the ability to stack a PST etalon with a Quark and then reduce down to around F20. But, ultimately it would weigh more than I want. Again, I want to mount something close to 8 inches, along with two small refractors around 30lbs total to have a very flexible imaging platform loaded up in the observatory ready to go at any time within 5 minutes. Convenience is key. And something else. Why would a 8 inch SCT be better than a 6 inch refractor? You win two inches, but you loose a lot because of the central obstruction. So by default, contrast is better in a refractor. This is a mistake in the case of ultranarrowband imaging! For planetary observing this is correct for contrast loss due to central obstruction and when apertures are equal. For our case: 8" has two more inches of aperture and so, 1.33 higher resolution - higher contrast for smallest details. Then... we know well that the slower the F/D at the etalon, the narrower the bandwidth = higher contrast. Central obstruction here acts as F/D slow down - there are no central rays and so, an etalon can be adjusted for outer (tilted) rays. Actually, centrally obstructed refractor will have slightly better contrast vs unobstructed. Summarize = good optically 8" SCT will have clear advantage vs 6" refractor in high resolution imaging. 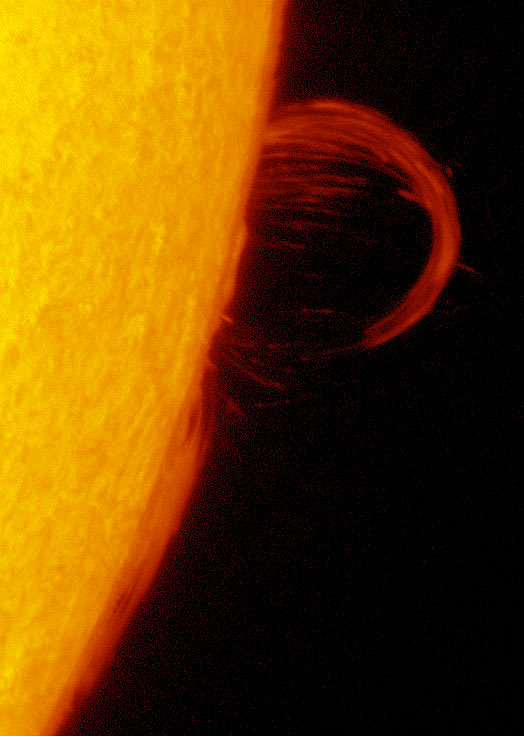 Where refractor has a clear advantage is dim, low contrast prominences - due to much better baffling and slower scatter. Thanks for taking the time of takin in/out focus images. This is helpfull. - There is a very significant level of spherical aberration. It could be because the thermal balance of the optics was not reached, or the optics are really bad, or both. - The thermal balance is not very good. You can see this by the reinforcement of light at 0h (out-focus) and 12h (in-focus). These are classic of SC when they are not in thermal balance. - The seeing is bad. This could be local seeing, tube seeing or anything else. - What is the temperature during daytime and during night time ? - Do you have a change in temperature all along the night ? The 10" SC takes some time to reach thermal balance (> 1h). The time necessary depends on the variation of temperature between day and night. So, you have to make sure your scope has reached thermal balance before taking in / out-focus image. Could you re-do the tests again, along with the temperature monitoring ? We could then conclude whether the optics are suffering or not of spherical aberration. At this stage, we don't know whether the scope is collimated properly or not. The seeing is really to bad. Another issue is the color of the walls of your observatory. It is black, which is good for night time, but ... really bad for daytime. I suggest covering the walls with the same kind of protection you've wrapped the scope in. 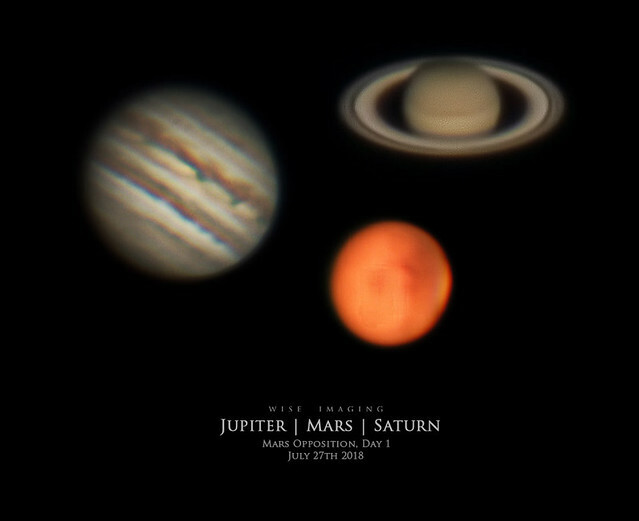 The comparison images taken with the 150 mm refractor are very interesting. With this level of (bad) seeing, it is not possible to do any better with a 10" telescope whatever the scope. The C8 Edge-HD is an excellent balance between portability, ease of use, optical quality and resolution. The only drawback is that you need a 210 mm ERF for Ha imaging, or go for a Hat 8". On the other hand, a 200 mm needs only a sub-aperture ERF and has more flexibility for the installation of various PST-mod. It's often around 100F during the day in there. At night, it may be in the mid 80F area, 70's as the coolest this time of year. My scope is always warmer than ambient temperature. In the morning it is cooler, and the ambient is often cooler than what is likely inside the tube when it's pointed at the sun, so the scope is again likely warmer than ambient then too. The temperature swing here is anywhere from 20~30 degrees F from day to night through the summer. This fall will be different. The scope is out there in the ambient in the observatory. Seeing that is good is limited time, so I probably will never be thermally acclimated with this scope without an active temperature control. This could be a total deal breaker if this is the case. I imagine I'm not perfectly collimated. Getting good collimation still requires the scope to be thermally acclimated to reduce effect on seeing. The intersting thing is how fast a 6 inch refractor can be used, compared to this 10 inch mirror in the same seeing. The refractor is clear and sharp and resolves convection cells. The 10 inch struggled and there's a weird quality to the image, as you pointed out, either bad seeing for that particular size or spherical aberration, etc. It's old after all, and not premium, so I doubt the optics are good. The inside is black. The outside is a light grey color. I drape reflective solar insulation material over the wall I shoot over in the mornings and it helps. Seeing that morning was not my best seeing, but I was still able to get better results with the refractor. I will have to try with an 8 inch SCT that is newer with quality optics to compare something better. After all this 10" SCT is 30 something years old. I doubt it's very good. The only reason I even put any effort into this SCT is because it throws up a pretty good moon image. But everything else is pretty much mush. I think so far, my long term goal without pushing it, is the C8 Edge HD. While I would love to have larger aperture like 11", it is a significant strain on the mount and I would need a new mount, plus, if my seeing doesn't support that size instrument, then I wouldn't be able to really benefit often compared to smaller scales. I image 2~3 times a week usually when whether allows between work days. So I'm more interested in something that I can image with often, rather than rarely. I get fairly good results with my 6 inch refractor at 5040mm focal length, so I imagine I could probably do ok with a 200mm aperture SCT and I could operate around F20 with it so that I'm not pushing the seeing, yet resolve more than my 6 inch. 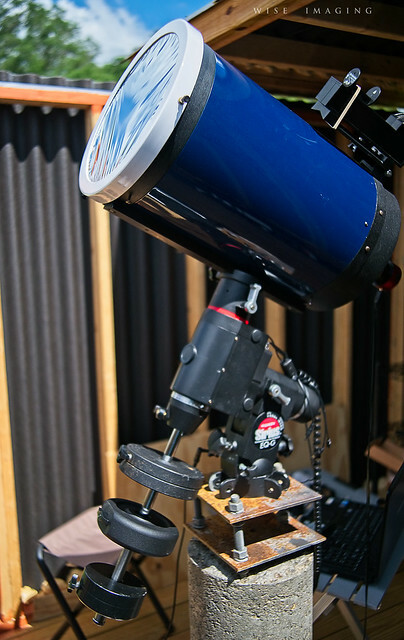 It would also be a versatile scope for DSO and planets when not being pointed at the sun. A full aperture ERF like Valery makes is within my reach for a scope like that, if I plan for it. Much more so than something 10~11" or so, things skyrocket fast (larger ERF, larger mount, etc). I think long term goal, I would like to have a C8 Edge HD mounted, with a double stack small HA scope (like PST or 60mm Solarmax) and a 60mm achromat for full disc calcium together side by side with the C8 to be able to do very quick sessions in several wavelengths without having to change scopes often and having to rebalance, realign, etc. I can image within 5 minutes of walking outside as it is right now in my observatory, and I'm a slave to convenience. I'm trying to balance what I can do, without pushing for something too big and too costly to use often. Here's another interesting clue. So, I'm red-green color blind, but when I observed the moon the other the night and posted the mosaic of it in this thread, I did take a look through an eyepiece. All my other scopes with that eyepiece show a fairly B&W, silverish, sometimes bluesh cooler temperature look for color on the moon (my APO, achros, etc). But with this 10" SCT, it was a warmer color, almost a green or yellowish color it seemed. Granted, I'm color blind, but it was a warmer color, that I can tell at least, instead of a cool color. Makes me wonder what that means? I've had scopes before that had distinct tint to them, some more blue, some more green. Does this mean much?